Concept: Building off of a smart insight around post Super Bowl baby booms, Hotel.com is planning to launch a timely sweepstakes immediately following the big game. Objectives: Promote Hotels.com during the Super Bowl, leverage sweepstakes to acquire first-party data. With 30-second spots now costing an average of more than $5 million during the big game, brands are getting smarter and more savvy about how they engage their consumers around the Super Bowl. Using mobile, social, and experience-driven activations rooted in first-party data, brands are deploying clever digital micro-moments to engage and capture their consumers attention without the massive price tag. 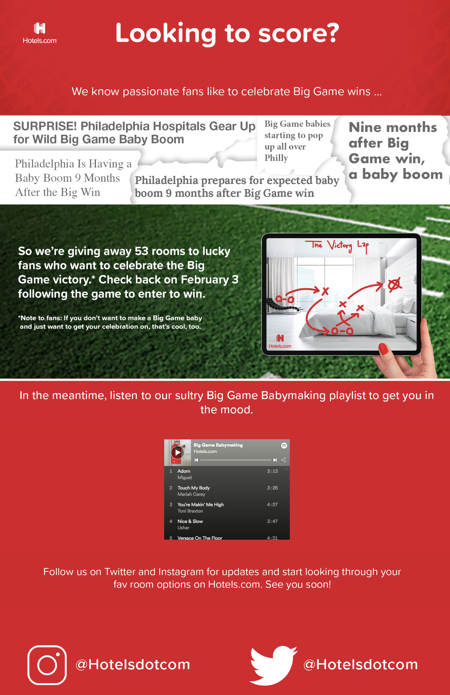 Hotels.com is being savvy this Super Bowl and will be launching a sweepstakes around the insight that after the big game, a lot of people are feeling pretty passionate about their team’s big wins, and 9 months later most cities see a big baby boom. Playing off of this insight, Hotels.com will be launching a sweepstakes, immediately following the big game on February 3rd, rewarding 53 lucky fans with a free rooms to celebrate the big win. Check out their campaign now for a tailored Spotify playlist here, and make sure to bookmark to enter after the game this Sunday! Spend where it matters. More brands are recognizing that many of Super Bowl viewers will be glued to their smartphones or other devices before, after and during the big game itself, making smart investments in social and digital microexperiences during and around the game a winning opportunity. Insight driven creative. Hotels.com had a great insight and they ran with it. Leveraging insights from research and through first-party, brands can more authentically engage consumers around creative that matters to them. Centralize your activities. Your social and advertising activities should all lead to one central experience for your consumers to engage with. Today’s marketers recognize the need to constantly build and nurture their audiences and many are doing so by driving audiences downstream to immersive digital campaigns via social and digital ads, emails, influencers, organic social posts, and broadcast spots. To see these best practices in action, check out Hotels.com’s microexperience here on February 3rd after the big game.